Have you ever attempted tried to express your thoughts or feelings only to have it twisted or misinterpreted? Poor communication, either in actions or words, may be misinterpreted causing pain or confusion. Our bodies also have an internal communication system. It regulates body processes through chemical, hormonal and electrical signals. Signals which can be influenced by our quality of food, environmental pollutants and even by personal stress. If we fail to get the correct signal or perhaps no signal then this affects the process response, which can lead to deterioration of health. There are two important communication pathways in our body called the nervous system and the endocrine system. The thyroid gland is part of the endocrine system. This butterfly shaped organ located at the base of your neck releases hormones throughout your body. Hormones help to control and regulate energy. These hormones help regulate your blood pressure, blood sugar, immune response, digestion, weight gain/ loss, body temperature, hair loss and more. Most of us have experienced some or all these responses in our body’s communication process. So, what are the hormones that are doing the talking? How can we find out if ours are communicating properly, and most importantly, how can we ensure that they do? The thyroid produces three main hormones: T3, T4, calcitonin. They are produced from a cascading signal beginning at the hypothalamus, in your brain (thyroid regulating hormone) to the pituitary gland (thyroid stimulating hormone) then to your thyroid which communicates down to your organs. That communicating signal, either produces or stops production of these hormones depending on the feedback signal your body gives. When there is a disruption in the signaling pathway, our body can have different responses such as an over or under production of these hormones. 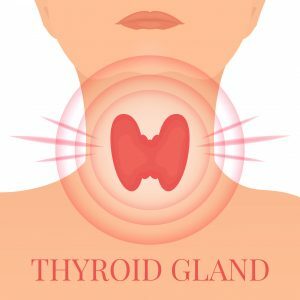 Over production can cause hyperthyroidism that can cause weight loss, rapid heartbeat, hair loss, anxiousness, insomnia, goiter, and/ or bulging of the eyes called Graves disease. Under production, hypothyroidism, causes fatigue, tired all the time, cold hands and feet, depression, drier skin, and brain fog. Left undiagnosed and untreated this could turn into the autoimmune disease called Hashimoto’s. If you are feeling some or all of these symptoms, what should you do? First find out how your hormones are communicating by having a thyroid panel orderd by your health practitioner. Make sure the test consists of: TSH, Free thyroxine (T4), T4, triiodothyronine (T3), thyroid antibodies. Once you find out the lab results you are now prepared to take control of your health. Seek out the guidance of a registered dietitian nutritionist that can personalize the right wellness plan for you. Other ways you can help maintain your thyroid function properly is by monitoring the foods you consume. Iodine rich foods such as organic yogurt and/or cheese, some ocean fish like cod or snapper, and eggs. Eat selenium rich foods like four Brazil nuts a day. Get adequate amounts of B vitamins and zinc in your diet. Also, keeping your vitamin D levels high is important in thyroid function. We like to see vitamin D (25-OH) on a lab to be between 60-80 ng/ml. External factors such as stress should be addressed also. How stressed are you? Finding subtle ways to destress yourself each day can go a long way in helping proper thyroid function. Perhaps a relaxing bath with lavender Epsom salts or meditating and deep breathing for 15 minutes. If you don’t already, try exercising 20 minutes a day to help reduce stress too. Is your environment filled with toxins? Try reducing or eliminating harmful thyroid inhibitors such as fluoride and/ or pesticides. American Thyroid Association. (2018). Thyroid Information | American Thyroid Association. [online] Available at: https://www.thyroid.org/thyroid-information/ [Accessed 3 Sep. 2018]. od.nih.gov. (2018). Office of Dietary Supplements (ODS). [online] Available at: https://ods.od.nih.gov/ [Accessed 3 Sep. 2018]. Cunningham E. Are There Foods that Support Thyroid Health? Journal of the Academy of Nutrition and Dietetics Volume 112, Issue 4, April 2012, Page 588. https://doi.org/10.1016/j.jand.2012.02.011.